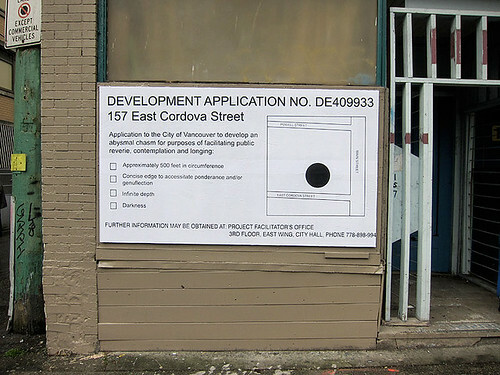 “Application to the City of Vancouver to develop an abysmal chasm for purposes of facilitating public reverie, contemplation and longing.” Makes me laugh every time I look at it. By my friend & Vancouver artist Aaron Carpenter. This entry was posted on Tuesday, March 29th, 2011 at 9:32 pm	and is filed under architecture, art, British Columbia, Canadian design, cities, graphics and signage, humour, urban planning, Vancouver. You can follow any responses to this entry through the RSS 2.0 feed. You can leave a response, or trackback from your own site.